Ruched silk sham with braid accents. EXCLUSIVELY AT NEIMAN MARCUS Silk sham with elegant ivory frame bordering flange. Front silk/cotton; back, cotton. Hidden zip closure. 25"Sq. 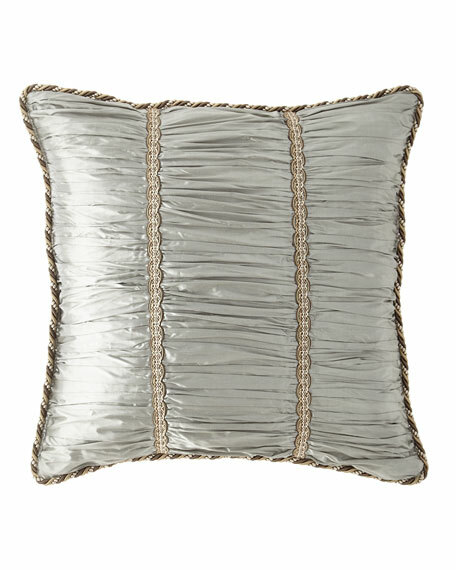 EXCLUSIVELY AT NEIMAN MARCUS Silk sham with elegant ivory frame bordering flange. Front silk/cotton; back, cotton. Hidden zip closure. 25"Sq. Dry clean. Made in the USA of imported materials. Plisse-damask fabric is woven in Europe of cotton/polyester/viscose. Sham has polyester backing, cord edge, and jumbo tassels. Dry clean. Made in the USA of imported materials. Velvet sham with metallic silver scroll pattern. Polyester/viscose front; polyester back. Brush fringe finish. Hidden zipper closure. 25"Sq. Dry clean. Velvet sham with metallic silver scroll pattern. Polyester/viscose front; polyester back. Brush fringe finish. Hidden zipper closure. 25"Sq. Dry clean. Made in the USA of imported materials.